Finally the time for the Sony Xperia Z1 has arrive and Sony brings in thier imaging-centric smartphone, the Xperia Z1. With the new device, Sony continues its trend of coming up with compact, water-and-dustproof smartphones. This time around, though, the company has also thrown in a range of new features for a better camera experience. The latest Sony flagship builds on the existing platform made by the Xperia Z and the Z Ultra. Let’s examine closely the specification of this brand new Sony Xperia Z1. As expected, the Xperia Z1 comes with the latest Android build in the market, Android 4.3 Jelly Bean. The smartphone comes with ample space for users to easily switch between multiple home screens. Apart from this, the Xperia Z1 lets users to easily change the order of their app icons in the menu to offer quick access to the most-used apps or any custom order that they prefer. The Xperia Z1 comes with a slightly tweaked image and video gallery, with Sony packing in its Music and Video Unlimited streaming apps as well. The display size of Xperia Z1, is definitely a step down from the company’s earlier offering, the 6.4-inch Xperia Z Ultra. That being said, the Xperia Z1 comes in with a good looking 5-inch full HD Triluminos capacitive display with a pixel resolution of 1080 x 1920 and a pixel density of 441ppi. This is similar to what was earlier seen in the Xperia Z. The Xperia Z1 comes with an all-glass front and back, strikingly similar to its older sibling. Like most other recent Sony smartphone offerings, the Xperia Z1 is completely waterproof. That means that the more adventurous among us will be able to drop it in a puddle of water, make calls in the rain and even take it to the shower (the reasons need not be specified). Unlike the earlier Sony model, which placed a flap over the headphone jack, the new smartphone comes with a waterproof jack itself, meaning that you will not need to pull out the flap every time you want to plug your headphones in. The Sony Xperia Z1 comes with Qualcomm’s latest Snapdragon 800 SoC. Packed into the CPU are four Krait 400 cores clocked at 2.2GHz. In addition, the smartphone comes with an Adreno 330 GPU and 2GB of RAM. The Xperia Z1 will definitely not lack in sheer processing power. 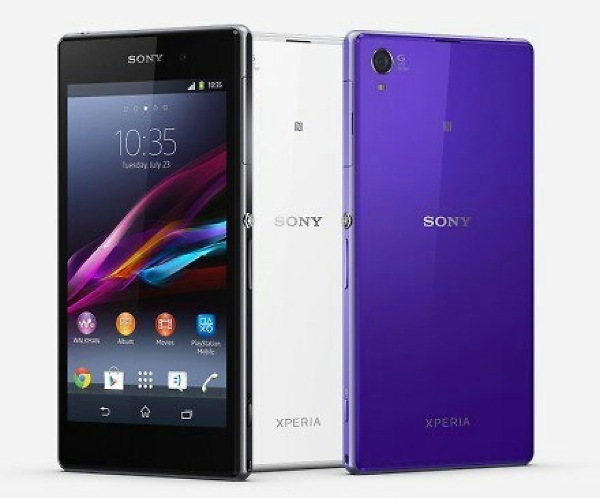 Internal storage-16GB with microSD slot The Xperia Z1 comes with 16GB of internal memory. In addition, the smartphone also sports a microSD slot on its water and dustproof form that allows for expansion up to 64GB. That should definitely be more than enough to store all the full HD videos that you may want to see on-the-move. Pride of place goes to the new camera that the Xperia Z1 comes to the market with. The smartphone houses a massive 20.7-megapixel camera. This is a huge step up from the 13-megapixel camera sported by its predecessor, but the company has said that this is just the tip of the iceberg. All-in-all, the Xperia Z1 looks like a good smartphone. With a form factor similar to the Xperia Z, the new offering definitely looks good. The massive camera and latest processor will ensure that users should not have any complaints with the smartphone. And the 20.7 megapixel sensor will ensure that the Xperia Z1 will stand firmly in the race for android smartphones with good cameras.